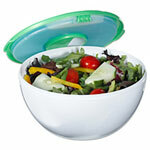 The Fit & Fresh Healthy Food Snacker is ideal to take along salads, fruits or vegetables for snacking. Use the entire container for your snack or divide it into two parts. When divided, the bottom part holds 2 cups of your favorite snack and the top part has a removable plastic food container that is designed to hold 1 cup of whatever dip, dressing or yogurt you like. An ice pack snaps onto the bottom of the removable container to keep your snack chilled and fresh. 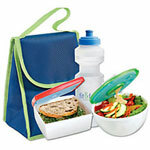 The entire food snacker unit easily clips onto your backpack, purse or gym bag for easy transport. 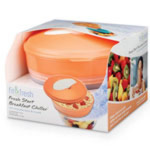 The Healty Food Snacker is top rack dishwasher safe, except for the ice pack and clip. 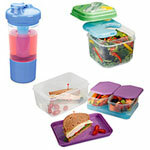 This snack container aids in portion size control as well as safe food storage. Clearance Item - All Sales Final: . This product was added to our catalog on Monday 27 November, 2006. Now Available: New PDF Catalogs. Download a full catalog, or select categories and create your own! The Drive Toilet Safety Frame has been a great safety featur .. Copyright 2003 - 2019 © Life Solutions Plus, Inc.